Sacroiliac Articulation – This joint was once classified among the amphiarthroses or cartilaginous joints. But nowadays it is described as a diarthrosis or synovial joint. This is because it is discovered that the joint has normally more movement than was previously believed. The Sacroiliac articulation is constituted by the articular surfaces of the sacrum and the ilium. The articulating surfaces of the sacrum and the ilium are covered with a thin layer of cartilage. This layer of cartilage is thicker on the sacrum than on the ilium. These cartilaginous plates are in close contact with each other and, to certain extent, they are united together by irregular patches of softer fibrocartilage and at their upper and posterior parts by fine interosseous fibres. In advanced life, they are separated by a space containing a synovia – like fluid. Hence the joint presents the characteristics of adiathrosis or a synovial joint. 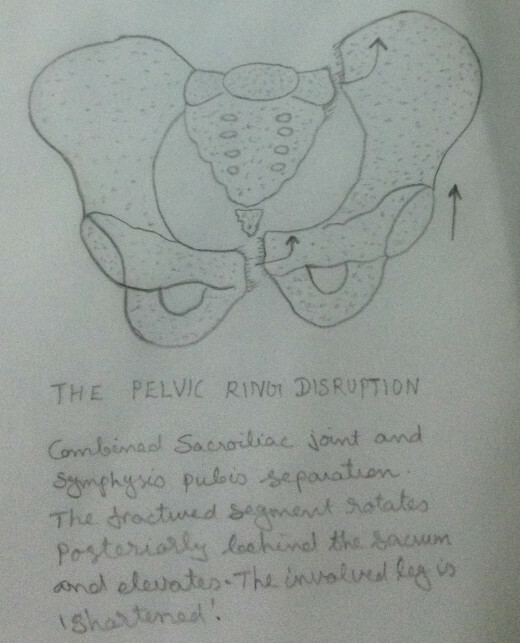 The bones are connected by the anterior sacroiliac ligament (which is composed of a number of thin fibrous bands) and the much stronger posterior sacroiliac ligament.The interrosseous sacroiliac ligament lies deep to the posterior sacroiliac ligament and consists of short and strong fibres connecting the tuberosities of sacrum and iliac. The body weight is imposed upon the fifth lumbar vertebra which lies on the sacrum. The weight is transmitted through the sacrum across the sacroiliac joints, through the ilia, into the acetabula and finally to the femora. The two compressive forces of femora is resisted by the super imposed pubic strut. When the bodyweight is borne in the sitting position, the forces tend to spread ilia. This is resisted by the symphysis pubis and the sacroiliac ligaments. The Sacroiliac articulation may be affected by the following pathological conditions with which the physiotherapists. They constitute sprains and subluxations of the joint rather than dislocations. During pregnancy – During pregnancy, the ligaments become much relaxed, softened and lengthened. The ligaments may remain in the relaxed, softened and lengthened stage for 6-12 weeks after delivery and in some cases even for much longer periods. After child birth they tighten again while the uterus is in the process of involution. In the erect posture, the weight of the body falls on the sacroiliac joints, and if their ligaments are not sufficiently strong, they give way and subluxation occurs. Incorrect posture naturally increases the strain at the sacroiliac joints and tipping the pelvis too far forward or too far backward. A gravid uterus further increases the strain. The ilium may be displaced forward on the sacrum or the sacrum may be displaced forward on the ilium. The latter being common after child birth. 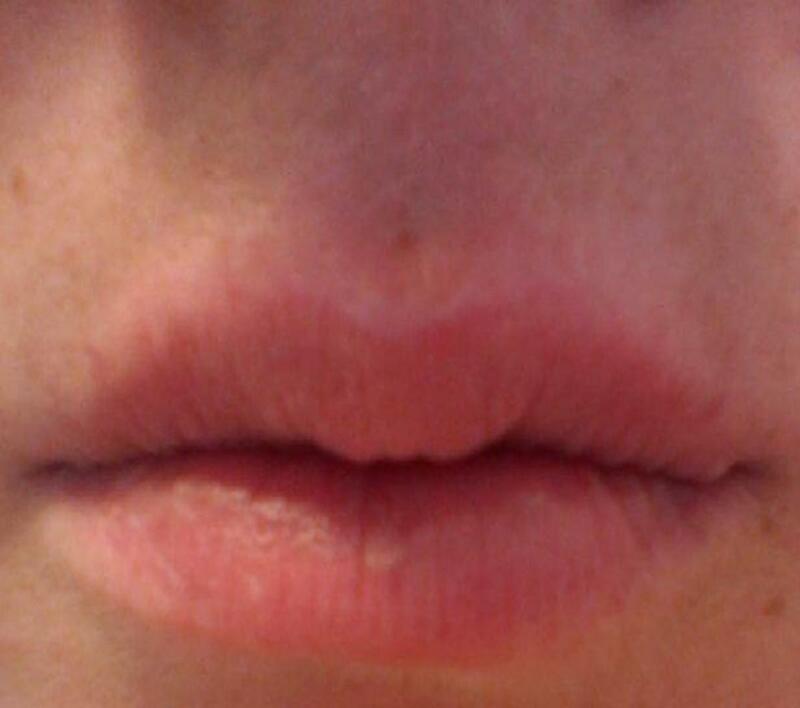 In either case the displacement may be unilateral or bilateral. Weak musculature following pregnancy is also one of the reasons leading to Sacroiliac joint problems. Habitual poor posture – Particularly in a position of lordosis. 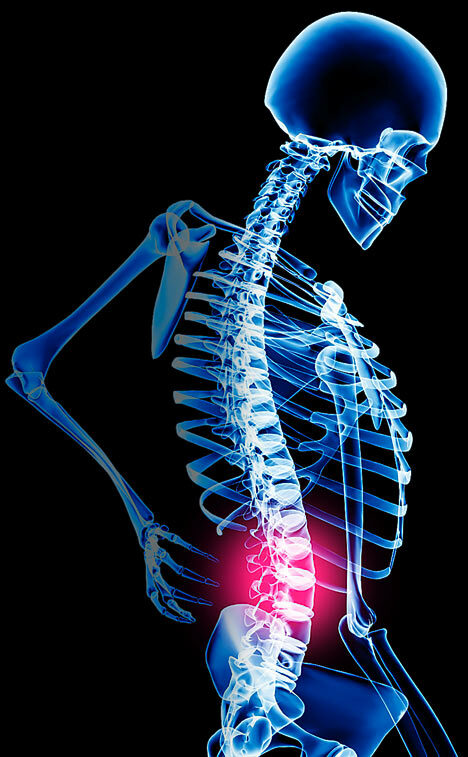 Strain or injury– When the patient bends forward, particularly while carrying a heavy weight. 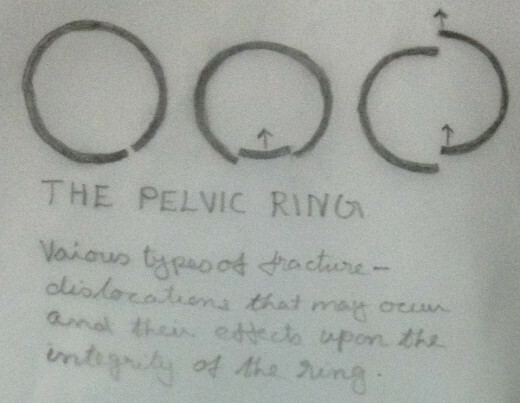 Pelvic Ring Disruption – Sacroiliac joint may be indirectly damaged by a forceful impact that disrupts the ‘Pelvic Ring.’ The injury must be, as a rule, severe and must be from external force. The Sacroiliac joint pathology may go unnoticed because of other severe visceral and musculoskeletal injuries. Only later, when the other injuries have subsided, the discomfort of the sacroiliac joints is noticed. The physiotherapist has a role if the joint has subluxation or strain, rather than dislocation. Ligamentous Lesions – The laxity of the anterior sacroiliac ligament, posterior sacroiliac ligament, the interrosseous sacroiliac ligament, the ligaments connecting the sacrum and the ischium,the ligaments connecting the sacrum and the coccyx and the ligaments connecting the pubic bones may lead to sacroiliac joint strain or subluxation. The Sacroiliac joint may be infected by tuberculosis, acute septic arthritis, acute suppurative arthritis, etc. In these cases the physiotherapist has little role in the acute stage. Sitting causes pain – Sitting in theatre, car driving, sedentary jobs etc. Standing causes pain – Prolonged standing. 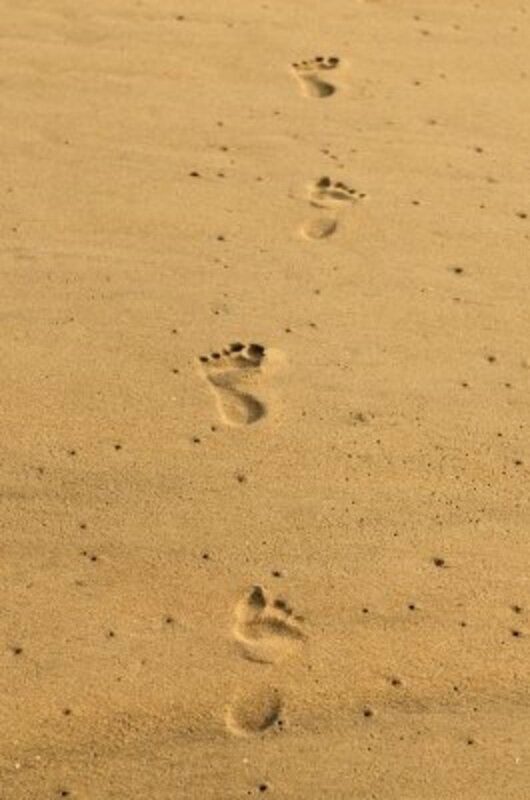 Walking eases pain – Walking in the morning worsen pain. But the pain may be relieved after half – an – hour walk. Leaning forward cause pain – Washing, ironing etc. But bending forward may not cause pain. Cough or sneeze causes pain – May cause pain in acute sacroiliac problems. Sleep may be disturbed – Sleep may be disturbed by pain. But may be relieved by walking. Slouching in chair eases pain – The weight of the body is taken by the sacrum instead of ischial tuberosity. Sensation of ‘pins and needles’ – May be felt in the back of the thigh. Groin pain- May be felt in sitting or standing. Tenderness – May be felt over the sacroiliac joint and the symphysis pubis. Pain or discomfort on attempted mobilisation of the joint. This test is performed by placing the patient supine on a firm bed and pushing down hard on both anterior superior iliac spines –causes pain. 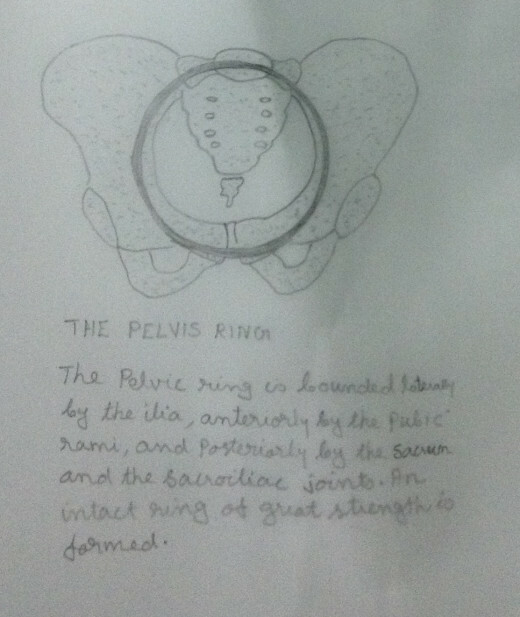 In the same starting position, the pressure can be exerted by placing both the hands on the outer pelvis rings and then compressing (bringing the hands together with force – causes pain. The pelvis can be rocked back and forth by pressing down on one anterior superior iliac spine and raising the opposite ilium manually – causes pain. The lumbar movements are usually full–The lumbar flexion is usually full but hurts if sacrum is displaced forwards. The lumbar extension hurts if sacrum is displaced backwards. Side flexion may hurt towards painful side. The weight bearing on the unaffected side – The patient tends to bear weight on the un affected side in standing and sitting and to step up with the unaffected side. The posterior superior iliac spine of the painful side is lower than its fellow. Similarly the anterior superior iliac spine of the painful side is higher than its fellow. The buttocks contour – is usually flatter on the painful side. The flattening may be due to the loss of tone of the gluteal muscle, because of the blocking of the sacroiliac joint of at side. With the patient lying prone, a rhythmic oscillatory pressure is applied to the apex of the sacrum by the examiner. This is done by executing pressure over the sacrum with the heel of the examiner’s hand, the arm being kept fully extended. This springing movement produces a shearing movement across the Sacroiliac joint. But this manipulation produces movement in the lumbosacral joint also. Still it is considered as the most reliable test. This manipulation causes pain at the joint. The patient is lying prone. The Sacroiliac joint may be stressed by stabilising the ilium with one hand and then moving the sacrum in a cephalad direction (in a direction towards head – as shown in the figure) with the other hand. This manipulation causes pain at the joint. The patient is lying prone. The Sacroiliac joint may be stressed by stabilising the ischial tuberosity with one hand and moving the sacrum caudally (in a direction towards leg – as shown in the figure) with the other hand. This manipulation causes pain at the joint. The patient is lying supine. The pressure is applied by the examiner’s hand against each anterior superior iliac spine, as if the examiner is trying to spread them apart (as shown in the figure). This manipulation may cause pain at the joint. The patient is lying supine. The iliac crests are compressed as if squeezing them together (as shown in the figure). This manipulation may cause pain at the joint. The patient is lying supine with the hips and knees flexed to 90 degrees with the feet flat on the bed. 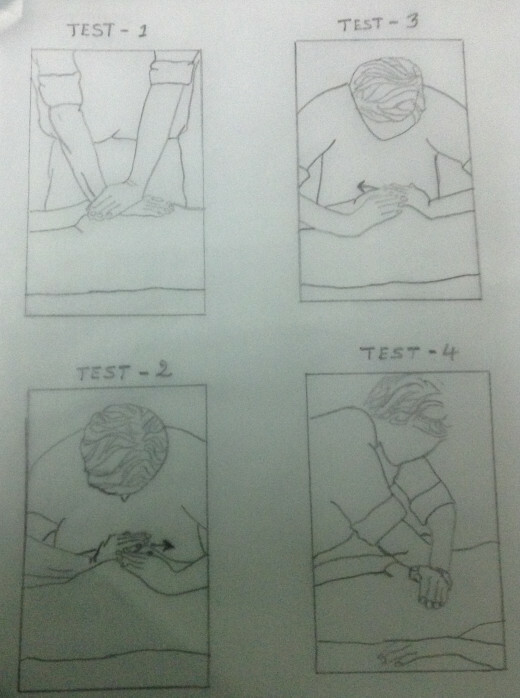 The adductors of the hipsare isometrically contracted by attempting to squeeze the examiner’s hand which is placed between the knees (as shown in the figure). This manipulation may cause pain at the joint. The patient is lying supine with the hips and knees flexed to 90 degrees with the feet flat on the bed. The examiner fully resists the patient’s attempt to spread the knees apart, thus producing an isometric contraction of the hip abductors(as shown in the figure). This manipulation may cause pain at the joint. The patient is lying supine with the hips at the edge of a couch. 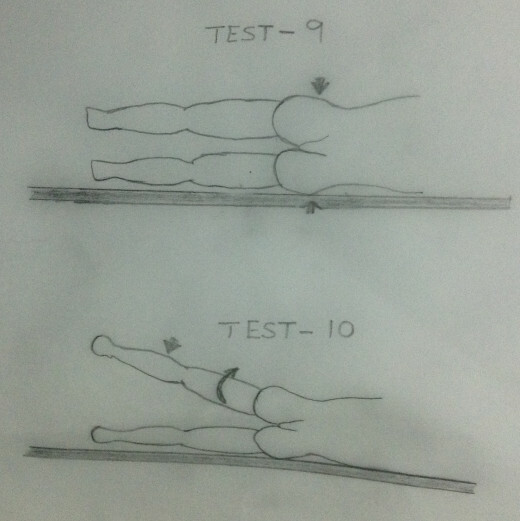 The examiner takes the leg on the painful side backwards into full extension at the hip (as shown in the figure). This manipulation may cause pain. The patient is on side lying with the painful side up. Direct pressure upon the iliac crest may cause pain (as shown in the figure). The patient is on side lying with the painful side up. 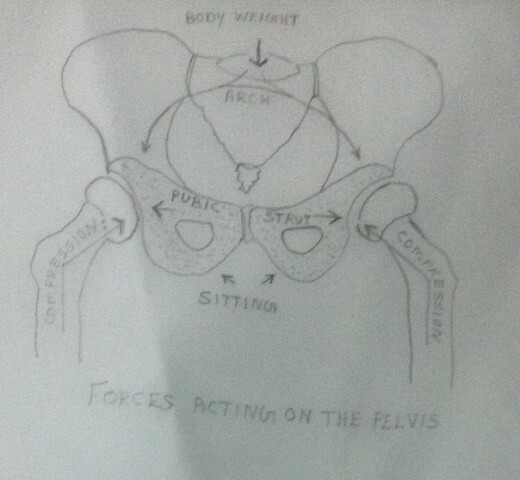 Resisted abduction of the painful side with hip extension may cause pain (as shown in the figure).